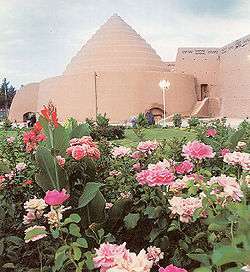 An ancient ice house, called a yakhchal, built in Kerman, Iran, during the Middle Ages, for storing ice during summers. Kerman Province (Persian: استان کرمان‎‎, Ostān-e Kermān) is one of the 31 provinces of Iran. 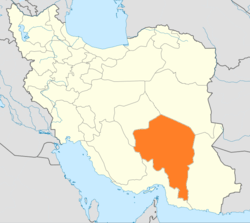 Kerman is in the southeast of Iran with its administrative center in the city of Kerman. In 2014 it was placed in Region 5. Mentioned in ancient times as the Achamenid satrapy of Carmania, it is the second largest province of Iran with an area of 180,726 km², that encompasses nearly 11 percent of the land area of Iran. The population of the province is about 3 million (9th in the country). 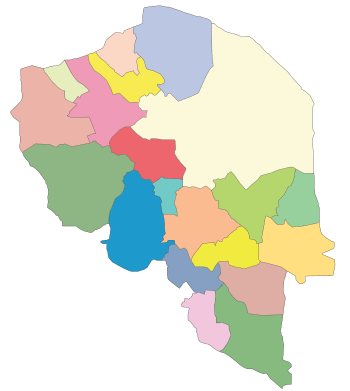 The main counties of Kerman province are Baft, Bardsir, Bam, Jiroft, Rafsanjan, Zarand, Sirjan, Shahr-e-Babak, Kerman, Mahan, Rayen, Kahnuj, Qaleh Ganj, Manujan, Roodbar-e-Jonob, Anbar Abad, and Ravar. The history of human settlements in the territory of Kerman dates back to the 4th millennium BC. This area is considered as one of the ancient regions of Iran and valuable historical vestiges have been discovered here. Jiroft is an example, where a previously unknown settlement dating back to around 2500 BC has been established by archeologists. Kerman has an abundance of historical sites and landmarks, 283 in total, according to Iran's Cultural Heritage Organization. Ancient abandoned citadels such as Arg-é Bam and Rayen castle have been preserved in the desert for 2,000 years. The altitudes and heights of the province are the continuation of the central mountain ranges of Iran. They extend from the volcanic folds beginning in Azarbaijan and, by branching out in the central plateau of Iran, terminate in Baluchestan. These mountain ranges have brought about vast plains in the province. The Bashagard and Kuh-e Banan Mountains are the highest in this region and include peaks such as Toghrol, Aljerd, Palvar, Sirach, Abareq and Tahrood. Other ranges that stretch out from Yazd to Kerman and Challeh-ye-Jazmoorian include peaks like Medvar, Shahr-e-Babak, Kuh-e Panj, Chehel Tan, Lalezar, Hezarbahr, Aseman and others. Most of the province is largely steppe or sandy desert, although there are some oases where dates, oranges (said to be the best in Iran), and pistachios are cultivated. In antiquity "Carmanian" wine was famed for its quality [Strabo XV.2.14 (cap. 726)]. The province is dependent on qanats (underground water channels) for its irrigation. In the central parts, Mount Hezar is the highest peak, 4465 meters above sea level. The climate in the province varies across regions. The north, northwest, and central areas experience a dry and moderate climate, whereas in the south and southeast, the weather is warm and relatively humid. The city of Kerman and the surrounding regions have a semi-moderate and dry climate, with a maximum and minimum temperature of 39.6 °C, and -7 °C respectively. The average temperature during the months of March–June has been recorded as 20°-25 °C. These months are the most suitable for traveling and tourism. Most of the population of Kerman are Persians and Turks of Afshar tribe, and Shi'a Muslims. There is a minority of Baloch population living in the south of Kerman Province and are predominantly Sunni. Kerman also has a small but culturally significant Zoroastrian minority. In 2011 the population of the province was 2,938,988 (1482339 male,1456649 female) in 786,400 households. 1684982 lived in urban areas, 1242344 in rural vicinities and 6082 accounted as non-residents. In 1996, 52.9% of Kerman's population lived in urban areas, and 46% in rural vicinities, the remaining 1.1% accounted as non-residents. In 2006 urban population made 58.5%, in 2011 this rate decreased by 1%. The city of Kerman (2011 population: 621,374) embraces about 80% of the urban population, being the most developed and largest city of the province. 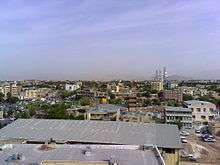 Kerman, the most populated and capital city of the province. ↑ Sykes, Percy (1921). A History of Persia. London: Macmillan and Company. p. 75.